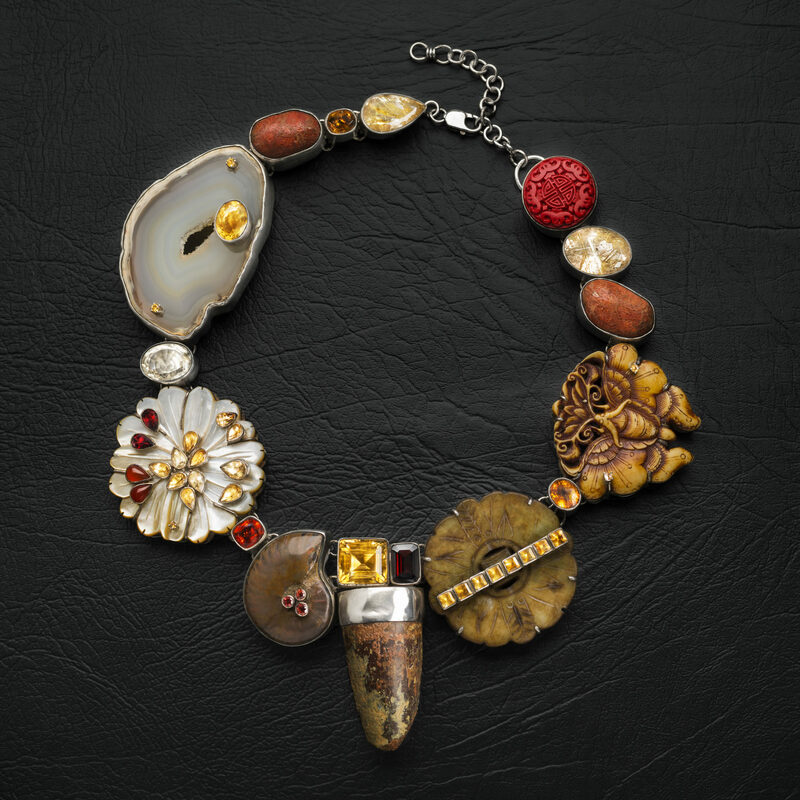 This necklace is comprised of Spinosaurus (dinosaur) tooth, faceted red garnet, citrine, opalised ammonite, mandarin and spessartite garnets, gold-rutilated quartz, brown carved stone set across the diameter with citrines, natural red zircons, resin butterfly and agate slice set with citrines, carved Chinese lacquer. A carved Mother of Pearl flower has been overlaid with carnelian and citrines; some settings tipped are with 18 carat gold. Cut stone and worked metal is a reference to “culture”. Cultural and historical references are a relatively new concept in necklaces, here imbued with a raw aesthetic that reaches back into the past. The necklace is made in silver and refers to the origins of the world when dinosaurs played out their own lives at a period of time far earlier than ours. Variations can be made to order. Price will vary according to availability of stones, metals and a dinosaur tooth. This necklace has the been set with Spinosaurus (dinosaur) tooth faceted large emerald cut red garnet, mandarin and spessartite garnets, citrine, gold rutilated quartz, brown carved stone or jade set in a bar across the diameter with square citrines, natural red zircons, coral, resin butterfly and agate slice set with citrines and carved Chinese lacquer and a slice of agate set with citrine. A carved Mother of Pearl flower has been overlaid with carnelian and citrine pear shape stones, those settings tipped with 18 carat yellow gold. Cut stone and worked metal is a reference to “culture”. 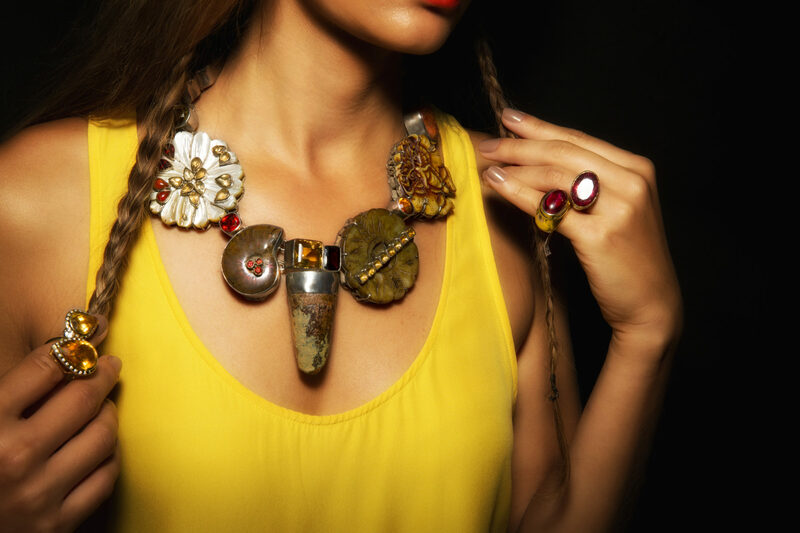 This is a new concept in necklaces – imbued with a raw aesthetic that reaches into the past and the present, nature and culture. The necklace is made in silver. This necklace refers to the origins of the world when dinosaurs played out their own lives at a period of time far earlier than ours.